Hello Stranger, Lisa Kleypas's fourth Ravenels book, has an unexpected virtue: it makes me much fonder of Marrying Winterbourne, the second installment in the series. When I first read Marrying Winterbourne, I complained about the flimsiness of the plot... but I had no idea how good I had it. The protagonists of Hello Stranger certainly sound like they should be dramatic enough to carry a novel. The heroine is Dr. Garrett Gibson, the first female doctor in England, and the hero is Ethan Ransom, a Scotland Yard detective turned government agent. After meeting in a previous book, Ethan has been keeping an eye on the fearless Garrett, but he is very aware that his job is dangerous, and acting on their mutual attraction would put her at risk. Garrett knows she can take care of herself, but she has no idea how much trouble Ethan is in. Once again, Kleypas devotes a hefty portion of her story to a medical crisis. In the past, I've found these chapters interesting and informative, but at this point Kleypas is in danger of turning into that Harlequin romance novelist who wrote approximately one million books about English nurses marrying Dutch surgeons. Meanwhile, the spy plot is pretty limp, and the protagonists' unique social positions (something Kleypas explored memorably in her most famous book, Dreaming of You) are underdeveloped. The story could still be saved with some intense romantic drama—if there was any, which there really isn't. 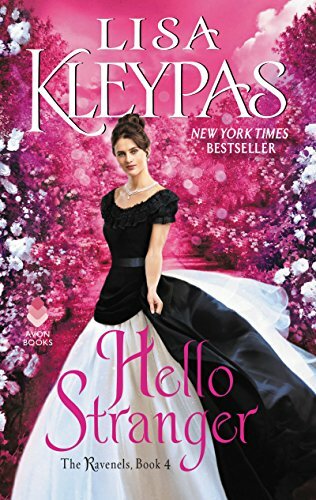 Admittedly, Hello Stranger features flashes of humor and sweetness, but I think Kleypas needs a little break after this series to recharge her creative batteries. I'll miss her, but I'm tired of books that feel like she put more effort into her research than she did her storytelling.